Nuts develop from the ovary of flowers, that’s why they are considered fruits, with the particularity of being surrounded by a hard shell and containing less than 50% of water. However, nuts and sunflower seeds are in fact the seeds of plants. In some cases, such as almonds, walnuts and pistachios, we talk about a type of fruit called drupe, consisting of an outer hull and a hard shell with the seed inside. Examples of other drupes are olives, apricots, plums, peaches, mangoes, cherries, dates, coffee, etc. 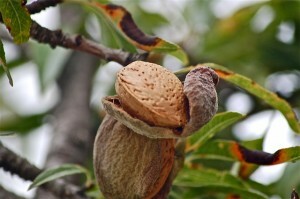 In the case of almonds, walnuts and pistachios, the real fruit is the outer fleshy part surrounding the shell that contains a seed, and it can be seen only when it is still on the tree, before it opens and drops the stone. The difference between drupe type nuts and fruits is that in the first case we eat the seed that is inside the stone, whereas in the second case, we eat the fleshy fruit which surrounds the stone. Punpkin seeds and other fruits’ seeds such as watermelon and cantelope are a different case. They also derive from edible fruits, however, they are not drupes, but a pepo type of fruit, which are berries with a hard, thick rind; typical fruit of the gourd family. But most nuts, sunflower seeds and other seeds such as linseed and sesame seed don’t derive from drupes nor from the pepo type fruits, consequently they don’t contain a fleshy pulp around the shell or stone. They are simply seeds surrounded by a hard shell. We also tend to include some foods such as peanuts in the category of nuts, which in fact are legumes and not nuts. So almonds, hazelnuts, walnuts, pistachios, pine nuts, cashews, macadamias, Brazil nuts, pecans, acorns and coconut are considered nuts. Although chestnuts are also classified as nuts, I will not consider them as such in this article due to their very different composition (rich in carbohydrate instead of protein and fatty acids). As for the seeds, I will write about sunflower seeds and pumpkin seeds. Nuts and seeds contain very high amounts of minerals. For instance, almonds, containing 234 mg calcium, are one of the plant foods with most calcium, after sesame seeds (1160 mg), seaweed (kelp 1093 mg) and kale (249 mg). (Milk contains 276mg calcium). It is also among the foods with the highest amount in magnesium. Moreover, it contains a significant amount of potassium, iron and phosphorus. As for vitamins, almond is the second most important vegetable source of riboflavin (vitamin B-2) after dry pepper, and it is also rich in all other B vitamins. 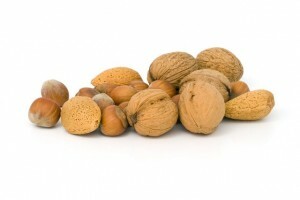 All nuts have similar properties, and are an important source of vitamins and minerals. Nuts and seeds have a high fat content, ranging from 70% to 88% of their composition (except pumpkin seeds, with only 38%). Most fatty acids are unsaturated. In some, there are predominantly monounsaturated fatty acids (omega 9), such as in almonds, hazelnuts, pecans and macadamias, while in others there are mostly polyunsaturated fatty acids (omega 6 and omega 3), such as in walnuts, pine nuts and seeds. In some others the proportion is 50%-50% such as in Brazil nuts. For example, 100g almonds contain 49g of fatty acids, of which 31g are monounsaturated, 12g are omega 6 and 3.7g are saturated. In 100g walnuts, there are 65g of fatty acids, of which 9 grams are monounsaturated, 38g are omega 6, 9 g are omega 3 and 6g are saturated. We should keep in mind that nowadays omega 3 and omega 9 are considered mainly anti-inflammatory fatty acids, while omega 6 being considered inflammatory. Given this theory, almonds, hazelnuts, pecans, macadamia, etc. would be more favorable than walnuts, pine nuts or Brazil nuts. On the other hand, polyunsaturated fatty acids (omega 6 and omega 3) are considered essential, meaning that the body can not synthesize them and that we depend on a supply of food source, while the other fatty acids can be synthesized in the body. Therefore, the recommended nuts would be the contrary to the above mentioned, that is, walnuts and pine nuts. As mentioned above, nuts and seeds are a great source of nutrients, however, at the same time they are also a major source of antinutrients, mainly oxalic acid, phytic acid, lectins and enzyme inhibitors. The antinutrients are substances that, unlike nutrients, are harmful to health: they are acidic to the organism, they prevent the absorption of minerals and they disturb the digestion in general. As explained in the article on anti-nutrients, all seeds (including nuts) are equipped with powerful hard shells and antinutrients to protect the "babies" of the plants from predators, unlike fruits, which are specifically produced to be eaten. This is the reason why nuts and seeds are so allergenic. Nuts and seeds are acidifying foods, except for almonds. An excess of acidifying foods is harmful to health because the body needs to counteract the acidity with alkalizing minerals in order to achieve a neutral pH in blood, which is achieved by taking calcium and magnesium from the bones or glutamine from the muscles. This leads to the appearance of health problems like osteoporosis, muscle atrophy, damages to ligament and joints, kidney problems and many other diseases. When heating food that contains unsaturated fatty acids such as omega 6, omega 3 and omega 9, fatty acids break down, becoming harmful to health. So in this sense, it is not recommended to toast nuts and seeds. However, the advantage is that roasting makes antinutrients decrease. Another healthy way to reduce antinutrients without destroying the fatty acids is soaking these foods the way it is specified in this article. Is there any test that can tell if a kind of nut or seed is not suitable for a certain person? Possibly, but only in some cases. Tests of food allergies and intolerances examine the body's reaction to the proteins in food. Thus, if a person develops an immune response of the same type as the food intolerances test, for example, IgG or IgE, then the test will result positive to that food. But there are a large number of immune reactions, most of which there are no commercial tests for. Another possible test to determine the convenience for a person of having nuts, it is the fatty acids test, which analyse the amount of fatty acid in the body, so that an excess of omega 6 and/or omega 9 can be diagnosed. Oxalic acid, which is in connection with kidney and neurological problems can be analyzed with the so called organic acid test. Lectins are one of the responsible factors for the leaky gut syndrome. There are different tests to test for this syndrome, though not entirely reliable. In addition, there are many other causes that can originate leaky gut. But the problem of an intolerance or allergy to nuts may come from other substances contained in our food such as phytic acid, or acidification, maybe a possible enzyme failure to digest the fatty acids or proteins the food contains, etc. In this case, there are no clinical tests that can determine if these foods are inappropriate for that person. For more information on tests consult this page. People who follow a vegan and/or raw vegan diet usually eat a lot of nuts because they believe that this way they can meet their protein and fatty acids needs. Almond and cashew flour are used to make bread, cakes, cookies, cake doughs and to replace everything that previously contained some kind of wheat flour. Health problems may arise in the case of those who do not follow any treatment to reduce antinutrients, or those who consume nuts in such quantities that even having undergone a previous treatment, the amount of antinutrients remains high. "I thought that raw meat was unsuited for the human diet and that the protein and fat of palatable raw tree nuts would take its place. As near as I can remember, after a period of about two months during which I consumed liberal quantities of raw tree nuts of several kinds, I began experiencing an unpleasant heavy sensation in the abdomen, and a feeling of extreme fullness, and some nausea. The symptoms were pronounced enough to force my giving up this tasty diet. Almost anyone can eat several nuts without feeling any effect. But it is common knowledge that nuts áre heavy on the stomach' if consumed in substanctial quantity. The enxyme inhibitors in seeds explain the mystery". While nuts and seeds do contain valuable nutrients such as calcium, magnesium, vitamin B and essential fatty acids, the remarkable amount of antinutrients makes them suspicious for causing health problems. If a person enjoys good health and has never noticed any problems related to the consumption of these foods, it indicates that their body is able to neutralize the inflammatory substances and nutrients. Conversely, if someone suffers from poor health, especially gastro-intestinal inflammatory diseases, allergies or auto-immune disease, they should avoid these foods, or at least do a previous treatment to decrease the amount of antinutrients.